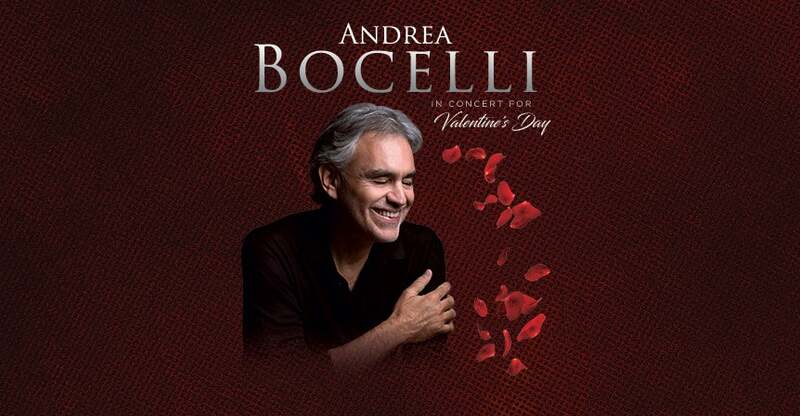 Andrea Bocelli returns to perform live in Concert for Valentine's Day at AmericanAirlines Arena Thursday, February 14, 2019! Upon his return to South Florida for his annual Valentine’s Day show, world renowned tenor, Andrea Bocelli is pleased to bring a special experience to Miami’s AmericanAirlines Arena for his February 14th performance. The experience will take place on the XFINITY EAST PLAZA deck of the arena, a beautiful covered outdoor space overlooking the bay and downtown Miami, and will include a number of high-end vendors offering for purchase everything from stone-oven pizza and hand-made pasta, to cigar rolling, Bocelli Family Wines, espresso bars, and more. Those who have already purchased tickets to the concert will have access to the experience. Additionally, as the concert is nearly sold-out, there will be a ticket solely for the plaza experience which will include Bocelli’s performance simulcast in HD to a large screen out on the plaza so that fans can watch the show while participating in the experience. The experience + simulcast tickets go on sale today at 9AM/EST and will cost only $30 + applicable fees.